The organizational potential your kitchen has does not depend on its size. Whether you are outfitting a kitchen in a trendy tiny house, a city apartment, or in your forever home, making the most of your storage space is paramount. Regardless of size, every kitchen has the essentials: a sink, stove, fridge, cabinets, and counter tops. Now the biggest question is, how do you utilize the space in these areas to make the most of your kitchen space? This is where creativity and organization go hand in hand with the kitchen’s design. Sometimes drawers have a tendency to clutter faster than other kitchen spaces. Simple kitchen tools get lost in a sea of disorder. We have the perfect solution with our StraightLine drawer organization system. The possibilities are endless with fully customizable sets that can create any design or arrangement you’d like. Sets can also run deep enough to fit stacks of dishes as well as bottled items. Blind corner cabinet access is a breeze with the LeMans! Rather than crawling into your cabinet to reach items stored deep within, the LeMans rotates its way around the cabinet door, making everything stored on its shelves visible and accessible. The chrome plating is one of our signature features and adds a sense of sophistication to your kitchen. Adding pantry organization systems is a great way to store and display your items. They reduce kitchen chaos by making everything easier to locate. An unorganized pantry is a modern day nightmare and all of those problems can be solved with our pantry organization systems. 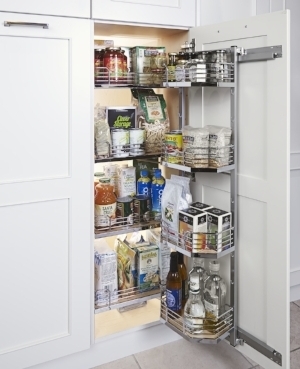 The Dispensa is a pull-out pantry system that utilizes the entire dimensions of the cabinet to extend and display your items. The Tandem is more of a cabinet style pantry with both shelves that glide out to you and shelves on the door to take advantage of the storage space provided.